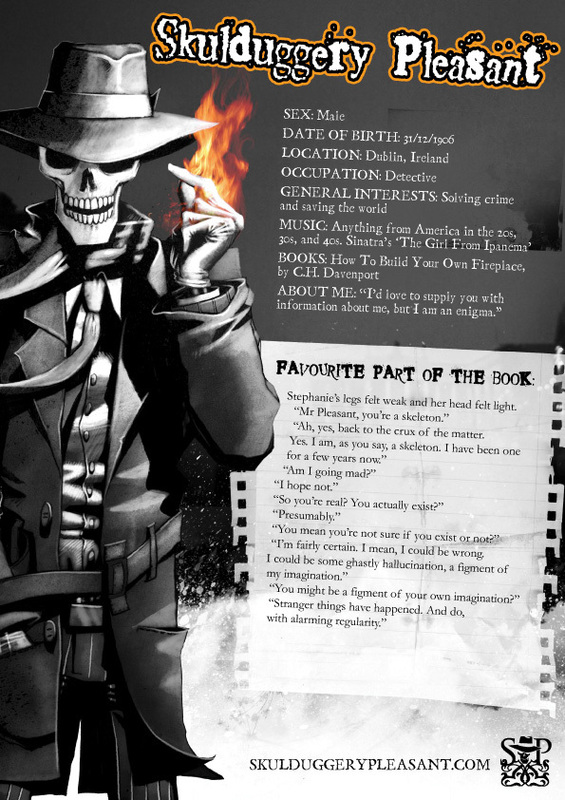 I heard about a month ago that the Skulduggery movie is on schedule for 2010!!! OMG!!! Will you go see it? I am, It sounds FAB! Also, do you think that it should be actors or do you think it should be that awesome dark cartoony look that the pictures are made to look like? P.S... David Tennant is set to be skuldug!!! He'll be great. He sounds so much like him!!!! i also would go see it, but some people sais that it is not going to be done :( ... ill prefer that the movie would be with real persons, i think its better. they'll hav 2 hav an awesome skulduggery costume if its real people!!!! IF THE MOVIE COMES OUT IM SEE'N IT FIRST NO MATTER WHAT!!! Johnny Depp would be an awesome Skulduggery voice! There's an aussie actress tat'd be a GREAT Valkyrie... can't remember her name though... idiot me... Im SO excited I MUST see it! ^ true. it annoys me how a person could be the best actor in the world but would get easily overlooked if you don't have referances from a drama school :/ Tad unfair don't cha think? It happened to my mate, and she's amazing. =\ dude... my school isn't a drama school... and one of the kids in the year below played alice in Alice in Wonderland! hav they done auditions for valkrie cainn yet? no, not yet. At least..... i don't think so. no-one knows when they are really. I wanna be Valkyrie cain so badly. I would look just like her if it wasn't for my deep tanned skin color. anyone know anything about the auditions? who nows when the movie came out??????? THEY NEED TO MAKE A MOVIE!!!!!!!!!!!!!!! DO YOU THINK THAT IT'S WEIRD THAT I'M ALREADY EXITED?!?!?!?! I read the first book last month, it is SO AWESOME!!!!!!!!!!!!!! I would DEFINETLY see the movie!!! anyone know how they will portray skul-man in the movie? CGI? hell of a goodspecial effects team? or just some plasticmask that looks realy fake? Izzi10scorpio u missed the second book called "playing with fire"
2) I love David Tennant. He is the best person to play him:)! !